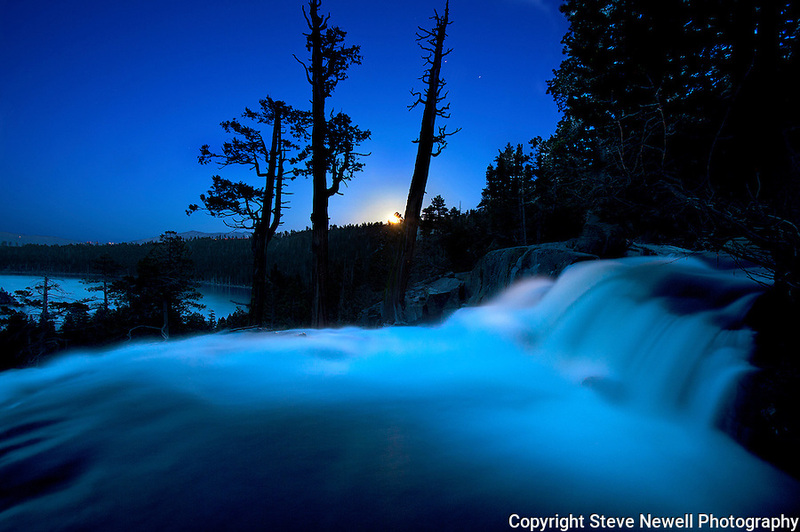 "Blue Moon" Eagle Falls- Emerald Bay Lake Tahoe, CA. This is a full moon rising over the Lake Tahoe Basin on May 5th, 2012. This image was taken at 8:37pm. I used a 30 second exposure, f8.0 aperture , ISO 400, 16mm lens. It was my first time using my Canon 5D Mark ll and I wanted to capture the moon lighting up the basin with the water in motion using a longer exposure. I set my wide-angle lens at 16mm to capture Eagle Falls and Fannette Island in Emerald Bay. In Lake Tahoe Emerald Bay is the most photographed location. You can find many different photographs of the sunrise with Lower Eagle Falls in the foreground that have Fannette Island included along with the sun rising over the ridge in the background. So I went out and shot a Full Moon rising over the waterfall. I used a 30 second long exposure to capture the available light in the area and it gave the water a milky flowing in motion look. The Sun had just set and the Moon was just rising so the sky was still incredibly blue. With the shutter open for 30 seconds it allowed the color of the sky to reflect on the water giving it the blue tint. Fannette Island can be seen down in Emerald Bay in the middle of the photo on the left side. The detail is so good you can see the reflection of the trees in the water that are located on the waters edge down in Emerald Bay. Stars can be seen in the sky, car lights on Emerald Bay road and house lights on Kingsbury Grade.